Managers are accountable for their employees and departments, and it is important for a manager to be aware or involved in the department’s daily work, even when out of the office. Here is how Laserfiche Mobile keeps managers in the loop by allowing them to participate in business processes and view business process history directly from their iPhone or iPad. Mindy is the director of the Human Resources department in a large organization. As part of her job, she frequently travels between the different company locations around the country. While out of the office, Mindy needs to stay on top of everything going on in the HR department including recruiting, new employee onboarding, benefits enrollment and employee training. She frequently has to field questions from the CEO or other department heads about the status of certain candidates in the recruiting process. Laserfiche Mobile allows her to do all of that, no matter where she is located. Laserfiche Mobile allows Mindy to participate in business processes by updating metadata and viewing business process instructions. 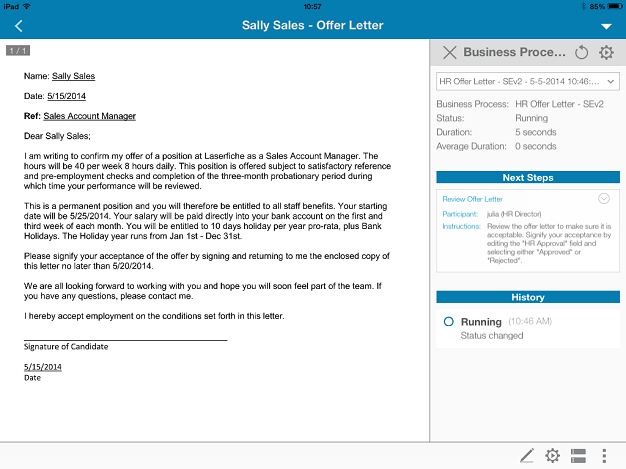 For example, as part of the HR Onboarding business process, an offer letter is generated and sent to the candidate. Before this letter is sent to the candidate, it must be approved by the HR director. Since job offers are time-sensitive, Mindy must review the offer letter as soon as possible. Mindy is notified of the offer letter to review with an email generated by Laserfiche Workflow. This email contains a Mobile URL to the offer letter document in Laserfiche. Mindy can quickly change the “HR Approval” field to “Approved” or “Rejected” once she is finished with the review. If Mindy needs to launch a Laserfiche business process while out of the office, she can also do it from her iPhone or iPad with Laserfiche Mobile. 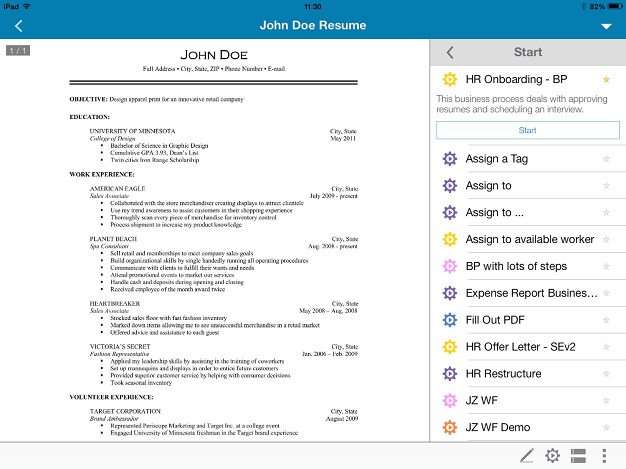 For example, if Mindy gets a job applicant referral and wants to fast-track the employee onboarding process because she knows the applicant can bypass the initial screening, Mindy can launch the “HR Onboarding – BP” business process directly from her iPad or iPhone. Mindy can also view the business process history of any HR document. If the company CEO wants to know which step the Executive Assistant candidate is at in the hiring process, Mindy can quickly find the candidate’s application and view the business process details to see everything that has happened thus far with that application. HR employees can view business process history on their iPads, allowing them to stay on top of everything that is going on in the department—even when they are out of the office. 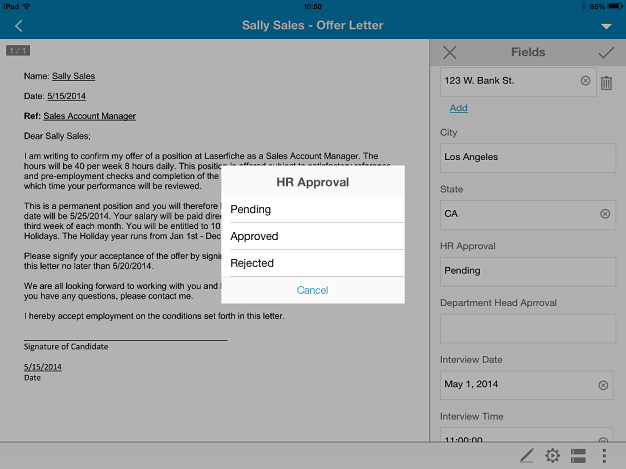 Since the HR director can review and approve offer letters directly from her mobile device, the HR onboarding process is not held up when she’s out of the office. 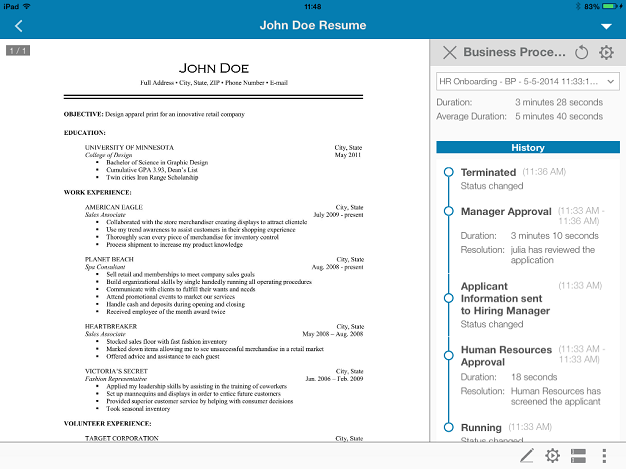 By launching the HR onboarding business process directly from her iPad, the HR director can quickly jumpstart the hiring of a prospective, qualified employee. This allows her organization to recruit new talent effectively.